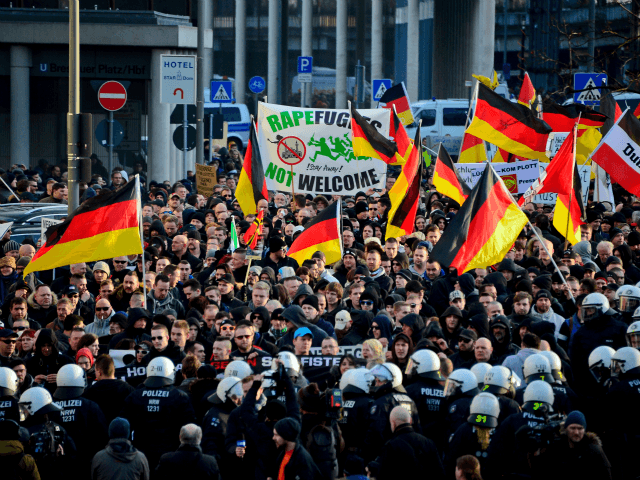 German Public Say "Auf Wiedersehen" To "Refugees Welcome"
A new study has revealed that German attitudes towards mass migration have dramatically shifted and that the era of “Refugees Welcome” may be coming to an end. Germany has come a long way since the start of the migrant crisis last year that saw scenes of German men and women welcoming migrants at train stations, cheering them on and handing out teddy bears and food. Terror attacks in Paris and Brussels, and a migrant crime epidemic which included the mass sexual assault of young women on New Year’s Eve in Cologne and across Germany have changed German attitudes drastically according to the findings of a socio-psychological study. The era of Willkommenskultur or ‘Welcome Culture’ may have come to an end, Zeit reports. The new study conducted by the Mercator Foundation along with the Institute for Interdisciplinary Research on Conflict and Violence (IKG) at Bielefeld University aimed to look in depth at how the continued impact of mass migration had effected the attitudes of Germans who were overly optimistic at the start of the crisis. The researchers found that less than a third of native Germans, or 32.3 per cent, still believed in the idea of the welcome culture and continued mass migration into Germany. One of the most interesting findings, according to the researchers, were the attitudes of Germans who themselves come from a migrant background. Among foreign born Germans only 41 per cent would like to see a continuation of mass migration and 28 per cent want an end entirely, believing migrants should not make any demands on the German people. Of the total participants in the study, half strongly fear the risk of terrorism because of the large influx of migrants. A third of the people say that Germany’s future is threatened by mass migration while 30.8 per cent say that the vast majority of migrants are not real refugees and are trying to illegally obtain asylum for a better life or economic advantages. These findings match what experts and even the German ambassador to Canada has stated regarding who should be considered an actual legitimate refugee. Germans are also becoming more adamant that migrants adapt to German culture. Previously, only 36 percent of Germans said that migrants should adopt German values, but a year into the migrant crisis the number has gone up to 53.5 per cent. Foreign-born Germans are even more concerned with integration with over 60 per cent of those surveyed saying that the new migrants need to integrate more fully into German society. The most telling piece of data in the study is a newfound desire to assert their traditional identity. Some 60 per cent of the participants said their traditions and values had been totally neglected in the mainstream media and politics. More telling for politicians and policy makers is that the statement: “We should pay more attention to avoid being overrun by migrants,” has gone from 28 per cent to 41 per cent in only the past year. The fears of migrant values, specifically Islamic values, superseding German ones was reflected in a study earlier this year when a majority of Germans totally rejected not only Islamisation but the encroaching public display of Islam itself.